This illustration demonstrates how each of the Nine Bodies in contained within the others. This drawing illustrates how the spiritual heart is the ultimate source of the physical heart. This illustration presents Balyogi’s view of the classical teaching of liberation and the Three Levels. 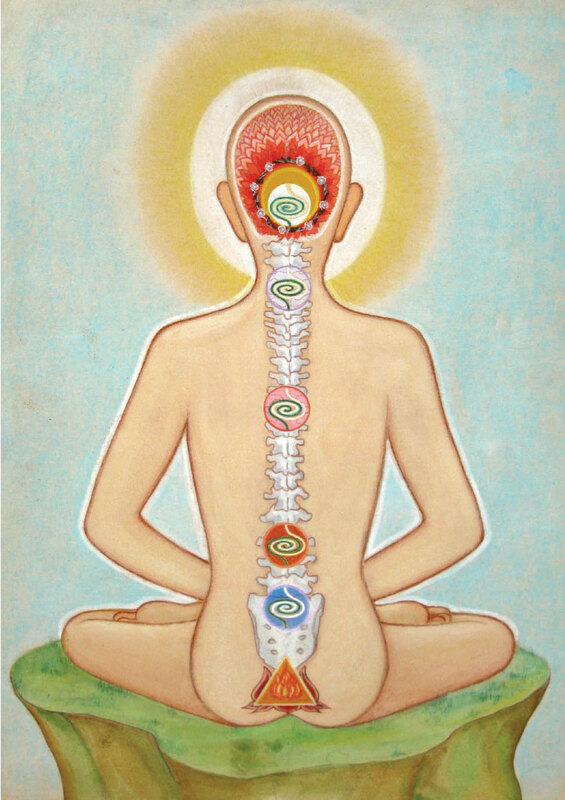 In this back view of the chakras, Balyogi is illustrating the flow of the energy through the spiraling cycles of each chakra. • An exploration of the Nine Bodies, the interactive levels of being within each of us, that make up the multidimensional aspect of our human experience. • A detailed description of the nature of consciousness and how to explore the various qualities and energies of consciousness in meditation. • A series of teachings in the form of twenty beautiful, mysterious illustrations (see examples at left) that reveal the subtle aspects of consciousness along with instructions in how to use the illustrations in your meditation practice. This book is the culmination of twenty years of study and practice of the Nine Bodies teachings that were transmitted to Phillip Moffitt by the Himalayan yoga master Swami Sri Premvarni Balyogi. Balyogi is one of a disappearing group of elder master yoga teachers in India who were initiated by their teachers in the knowledge of the Himalyan yoga forest tradition. • You are interested in the subject of consciousness. • You would like to explore the relationship between moments of mindfulness and the field of consciousness. • You would find it helpful to have a map to locate your meditation experience in regards to the various levels of consciousness. • You have had visual or audio or energetic experiences for which you would like to have understanding. • You enjoy decoding the meaning of symbolic images. • You believe that in addition to the physical, intellectual, and emotional aspects of our experience, there is also a subtle energetic aspect. • You are intrigued by the idea of a comprehensive map of the levels of being. • You find it appealing to explore particular aspects of consciousness through specific meditations. • You would like to access the many subtle levels of consciousness. I first met Sri Swami Balyogi Premvarni, a yogi in the ancient Himalayan forest tradition, in 1999 during a visit to his ashram in Rishikesh, India. I went there at the urging of a friend and my only intention was to ask him a question about an energy blockage in my throat. That visit was the beginning of a long journey of learning Balyogi's teachings on the Nine Bodies system of wisdom about the wholeness of a human being—mind, consciousness, body, spirit, and more. This system is based in ancient Tantric and yoga traditions combined with Balyogi's own understandings. 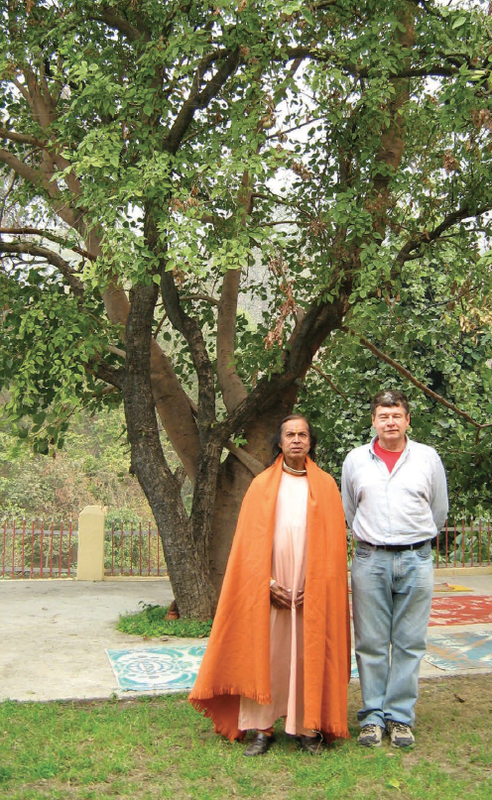 After that first meeting, I returned to Rishikesh many times to study with Balyogi. And, for years, I practiced the teachings such that I had a direct experience with what Balyogi was pointing me toward. When I was ready, I shared my experiences of these teachings with experienced meditation students on a limited basis. Many students found them to be of great value and asked for more in-depth exposure. Due to this student response and at Balyogi's urging, I resolved to write a thorough explanation of my own understandings of consciousness that have arisen from working with these teachings. I began to write Awakening through the Nine Bodies ten years ago. This project turned out to be a more formidable challenge than I had anticipated. The book constitutes my own insights regarding consciousness that have arisen from so many years of exploring these teachings. In it, I describe how it is possible to move beyond ordinary mind states into a new direct awareness of the nature of consciousness itself. I offer a detailed description of the nature of consciousness and how to explore the various qualities and energies of consciousness in meditation. In addition to this in-depth investigation of the nature of consciousness, the book also includes a series of teachings in the form of twenty beautiful, mysterious illustrations that reveal the subtle aspects of consciousness along with instructions in how to use the illustrations in your meditation practice. Balyogi says he created these illustrations during a period of intense Samadhi when he had a series of revelations and visions about the structure of consciousness. I offer detailed interpretations of each illustration along with precise meditation instructions intended to guide one toward a particular state of consciousness. My deepest aspiration is for this book to be helpful to Buddhist and Patanjali yoga practitioners in their meditation practice by pointing to and explaining some of the varieties of experiences of consciousness in meditation. These practices are meant to be complementary to your lineage practice and not a replacement for it. If you delve into the Nine Bodies teachings and practice them, you will find that there are instructions for clearing obstacles from your path so that you can fully utilize your meditative states and insights on your journey of awakening. The teachings presented in this book are my best effort to discern and point to what is true and useful for you to explore regarding the Nine Bodies in your meditation practice. With exploration and practice, it is possible to gain new understandings, more flexibility in your meditation, and possibly a new energetic facility in your mind. If you are curious to explore these teachings with me, I will be leading several Nine Bodies retreats in the coming months. “How can we map the inner terrain of consciousness, locate ourselves within it, and even choose to travel in different dimensions to discover ever more subtle qualities of existence? Phillip Moffitt’s Awakening through the Nine Bodies directly addresses these perennial queries and offers us an ancient map highlighted with vivid illustrations from his Indian teacher Sri Swami Balyogi Premvarni. While this nine-fold framework has crossovers in other yogic, Taoist, and Tibetan Buddhist systems, Phillip’s explication of this labyrinth along with his meditation instructions manage to unpack it all with a beautiful clarity and simplicity that does not in any way diminish its depth. I will be enjoying this book for years to come and will be highly recommending it to all those seeking true inner freedom.